As never before or since, Richard Wagner's name dominated American music-making at the close of the nineteenth century. 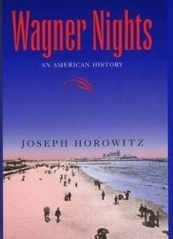 Europe, too, was obsessed with Wagner, but as Joseph Horowitz shows in this first history of Wagnerism in the United States the American obsession was unique. The central figure in Wagner Nights is conductor Anton Seidl (1850-1898), a priestly and enigmatic personage in New York musical life. Seidl's own admirers included the women of the Brooklyn-based Seidl Society, who wore the letter "S" on their dresses. In the summers, Seidl conducted fourteen times a week at Brighton Beach, filling the three-thousand-seat music pavilion to capacity. The fact that most Wagnerites were women was a distinguishing feature of American Wagnerism and constituted a vital aspect of the fin-de-sicle ferment that anticipated the New American Woman. Drawing on the work of such cultural historians as T. Jackson Lears and Lawrence Levine, Horowitz's lively history reveals an “Americanized” Wagner never documented before. An entertaining and startling read, a treasury of operatic lore, Wagner Nights offers an unprecedented revisionist history of American culture a century ago.